With just a little regular maintenance, you'll have clean conditioned air all year round. Though often overlooked, air conditioner filters are responsible for a mighty important job: keeping dust, dirt, and other debris out of the air we breathe indoors. As they improve your air quality, they also get clogged with all of that aforementioned gunk, which makes cleaning them throughout the year vital for the sake of your health—and your wallet. 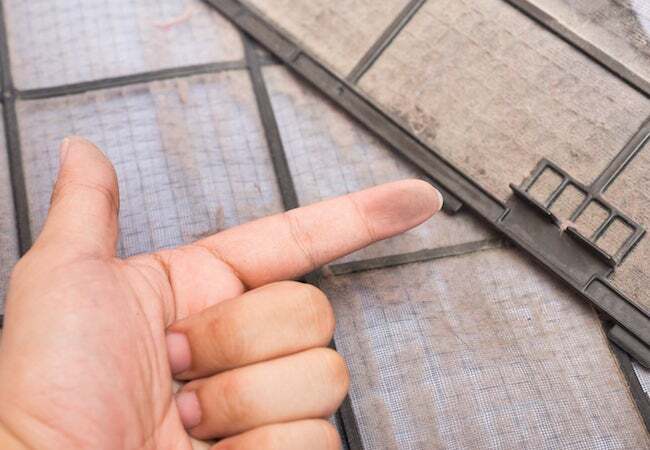 When a filter is dirty, it forces the air conditioner to work harder in order to push air through its clogged fibers, using more energy to do so and thereby shortening its lifespan. Avoid high utility bills and mechanical problems down the road by keeping the air conditioner filter clean. Removing it once a month (or twice during seasons of high use) and assessing it for either cleaning or replacement should keep quality and energy use in check. Examine the condition of the AC filter to see if it needs to be cleaned. To do so, first make sure your system is turned off—you don’t want unfiltered air circulating throughout your home while the filter is removed. When it’s safe to continue, unscrew the vent cover or use the release handle to remove the filter. Gently slide it out, being careful not to damage it, and then give it a thorough look over. The filter’s exact location will depend on your HVAC system. Most units house their filters just behind the return vent, typically found either near the ceiling or close to the floor. Some systems may have multiple return vents (particularly in very large homes), so check around to make sure you’re not overlooking any filters during this maintenance. When in doubt, call your manufacturer and ask where the AC filter can be found and if your system uses more than one. If you can see any grayness, discoloration, or visible surface dust on the AC filter, clean or replace it. • Remove the dust and dirt from a reusable filter (one with a plastic or metal frame) with a handheld vacuum cleaner or with an attachment at the end of an upright vacuum’s hose. Or, for an even deeper clean, use your bathtub faucet or handheld shower head to run warm water through the filter in the opposite direction of airflow. To do this, check to see where the dust is most visible, and then face that side downward; the water should hit the opposite side and pass through in order to rinse out the gunk without pushing it deeper into the filter. • If your AC unit uses disposable filters (which are often framed in cardboard), simply replace the dirty disposable filter with a clean one from your local hardware store. Check the size, listed on the side for your convenience, to avoid buying one that doesn’t fit. Then, skip to Step 4. If you’ve washed your reusable AC filter, let it dry thoroughly. Consult the manufacturer’s instructions for any special steps you might need to take, but, generally, leaning it against the side of the bathtub for a few hours and flipping it over midway through should do the trick. You can use a hairdryer set to “cool” to speed things up, but beware that too hot of temperatures can burn or otherwise damage the filter. Reinsert either a clean, dry reusable filter or a new disposable into your AC unit. Just like the removal process, this part is easy: Simply slide the filter back into its designated slot, making sure the arrows on its frame point away from you and toward the unit. Stay on schedule. To keep your airflow fresh all the time, set up a monthly reminder to check the AC filter’s condition. 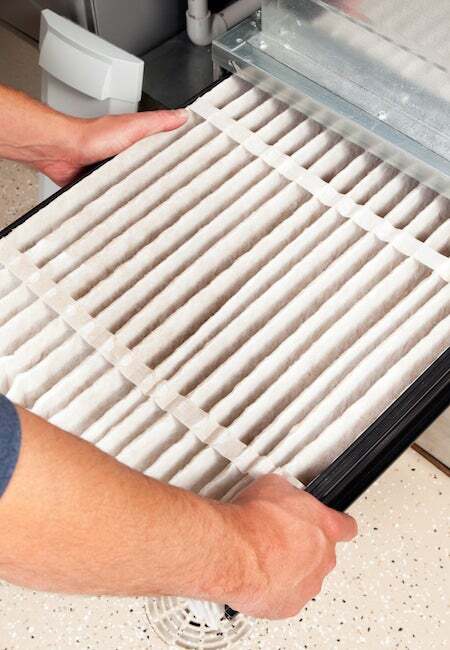 If needed, cleanse or replace the filter in your AC unit at this time. Warm climates may require more frequent checks in the summer, while cold climates may need more maintenance in the winter. Once you’ve figured out the rhythms of your particular unit, make a schedule and be sure to stick to it so you can breathe easy all throughout the year.